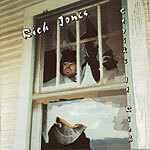 Not only do I love this CD I love all of Rich Jones new work. His music is true Blues with a touch of attitude. I can honestly say his talent is beyond compare. Rich and his band have come far since their days in tiny little Eureka Springs. They are accomplished, musicians,songwriters, and performers who know how to take it to the next level. Watching Rich take a single word and turn it into a musical masterpiece is something akin to being made love to for the first time. I hope there are some new CD's out there soon.